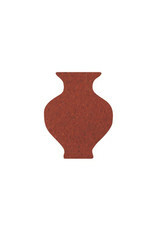 This Red Stoneware is suitable for potters seeking high firered clay. Fine textured makes it excellent for throwing large pieces, hand building and without the fear of slumping. It can also be used as a Red Raku body. With outstanding plasticity and the right amount of tooth makes it resistant to warping, cracking and thermal shock. At 1100°C - 1180°C firing yields a brick red colour. Increasing the temperature to 1220°C-1260°C the colour gradually darkens to rich reddish brown.